Project timesheet includes custom project timesheets, project time approvals, stop watch features, project and attendance, and custom project time details tracking. Project timesheets memorize project and task picklist values as you go. Copy forward features allow employees working on long-term projects to set their timesheet and it will copy forward data templates from week to week. Pacific Timesheet provides many standard and custom timesheet templates for engineering, construction, IT departments, and other project-oriented workers. Employees can use a stop watch to start and stop timers as they move back and forth between projects and tasks. Track project/job time and attendance. Error checking flags timesheets where project/job time and attendance do not match. In addition to standard timesheet templates, you can create custom timesheet templates that include any timesheet and data fields in any order. Employees can allocate the percentage of their time spent on projects, jobs, tasks or time off. Validation rules enforce that workers account for 100% of their time. Time Entry Details You can capture notes of up to 4,000 characters with any time entry. You can also capture any other time entry value you require, including list, text, numeric and other data. Display on the timesheet any totals such as overtime, double time, time off or other values being tracked. Project/job time tracking features include a project manager dashboards, project actual and planned start and finish dates, multiple project billing rates, pay rates and more. Project Manager Dashboard Project managers can view an entire project's activities and tasks on one screen: planned versus actual start and finish dates, estimated versus actual hours, task status, and percent complete for tasks. Capture comments of up to 2,000 characters for the entire time period. 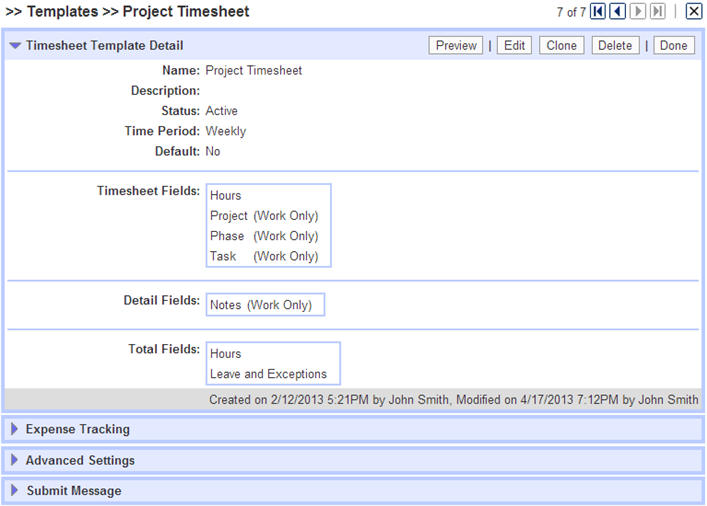 Search through all project timesheets using key words and phrases. Employee preferences can be set to have the last period's timesheet automatically copy forward to the current period. Or an employee can copy timesheets forward manually. They have the option of copying forward just the timesheet rows, or the rows and hours, too.